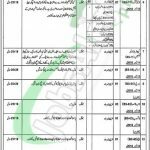 Tap this page for District & Session Court Jhang Jobs 2018 Application Form Download & Test Date. Jobs in District & Session Court Jhang are available and due to this session court is looking for highly educated, very experienced, skilled, hardworking and well-disciplined candidates for the following positions. Jobs in Session Court are (Stenographer, Assistant Librarian, Data Entry Operator, Budget and Account Examiner, Junior Auditor, Junior Clerk, Computer Hardware Technician, Driver, Cook, Naib Qasid, Sweeper, Mali, Chowkidar). The announced positions are on different quotas such as Open Merit/Women Quota/Minority Quota/Disabled Person Quota/Retired Employees Quota and all interested applicants having Punjab Domicile can apply under above-mentioned quotas. Those who are interested to apply are suggested to read the eligibility criteria carefully before applying for any vacant position and generally, Masters/Bachelors/Intermediate/Matric/Middle pass candidates can apply. Now, in the following, we'll discuss the applying criteria for the above-mentioned vacancies. Candidates may download the application form to apply from www.jhang.dc.lhc.gov.pk or from the www.JobsAlert.pk. Application Form filled carefully along with all attested documents should reach the following address through registered post. The last date for submission of application is December 12, 2018. Applications received incomplete or after the last date will not be entertained. Test / Interview date can be examined in the following job advertisement. Last Date of Apply: December 12, 2018. Address: District and Session Court Jhang.